WMAP First-year Paper Figures, Spergel, et al. Comparison of the best-fit power-law ΛCDM model to the WMAP temperature angular power spectrum. The gray dots are the unbinned data. 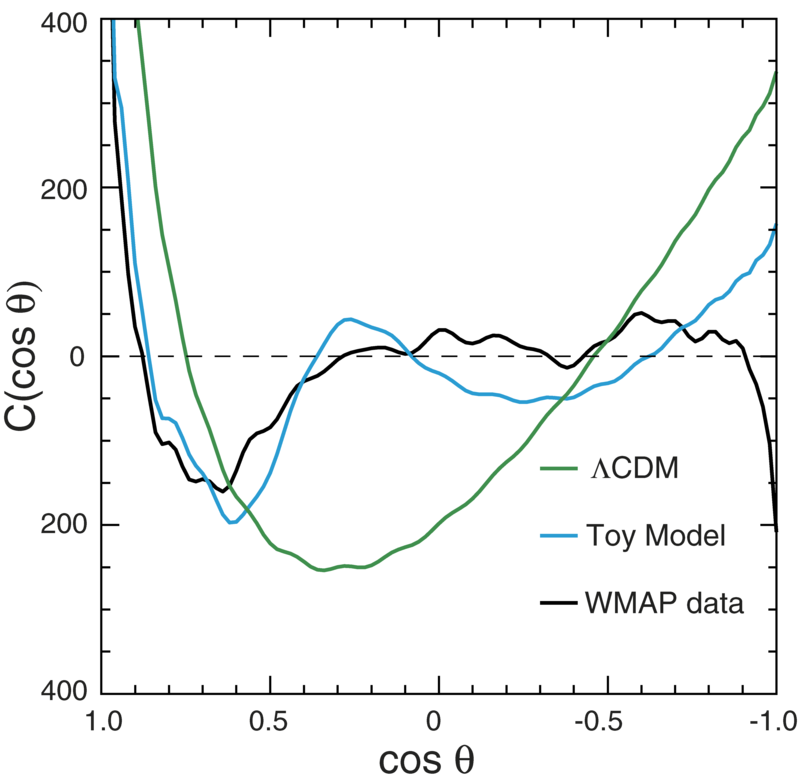 Comparison of the best-fit power-law ΛCDM model to the WMAP temperature angular power spectrum. Contribution to 2 ln L per multipole binned at Δl = 15. 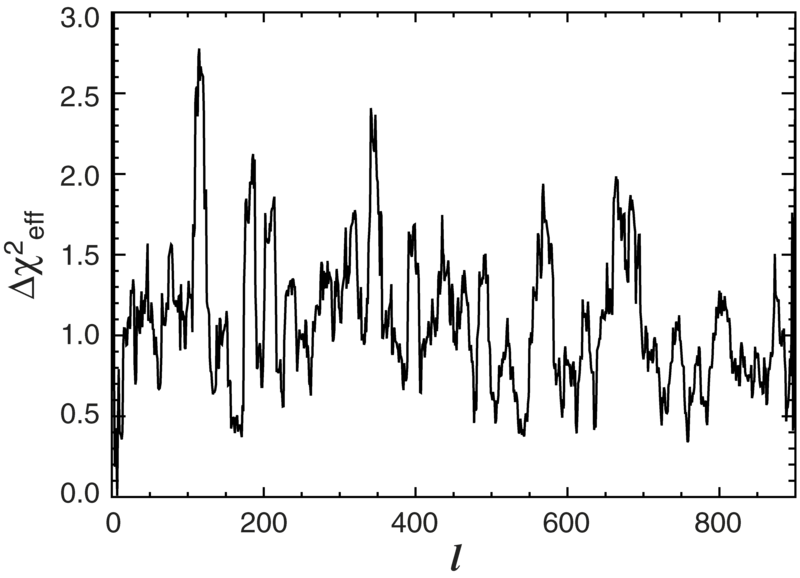 The excess Χ2 comes primarily from three regions, one around l ~ 120, one around l ~ 200, and the other around l ~ 340. Likelihood function of the WMAP TT+TE data as a function of the basic parameters in the power-law ΛCDM WMAP model (Ωbh2, Ωmh2, h, A, ns and τ.) The points are the binned marginalized likelihood from the Markov chain, and the solid curve is an Edgeworth expansion of the Markov chain’s points. The marginalized likelihood function is nearly Gaussian for all of the parameters except for τ. The dashed lines show the maximum-likelihood values of the global six-dimensional fit. Since the peak in the likelihood, xML, is not the same as the expectation value of the likelihood function, (χ), the dashed line does not lie at the center of the projected likelihood. Spectral index constraints. 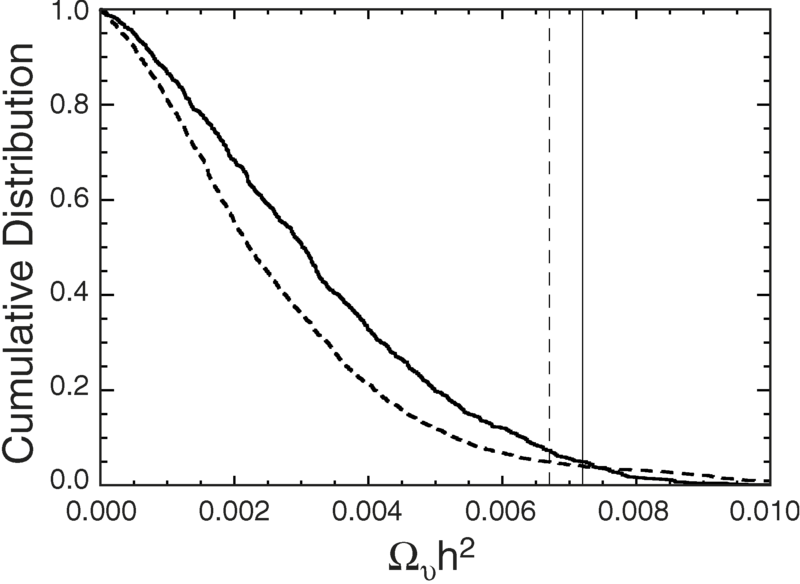 Left: ns-τ degeneracy in the WMAP data for a power-law ΛCDM model. The TE observations constrain the value of τ and the shape of the ConeTT spectrum constrain a combination of ns and τ. Right: ns-Ωbh2 degeneracy. The shaded regions show the joint 1 and 2 σ confidence regions. 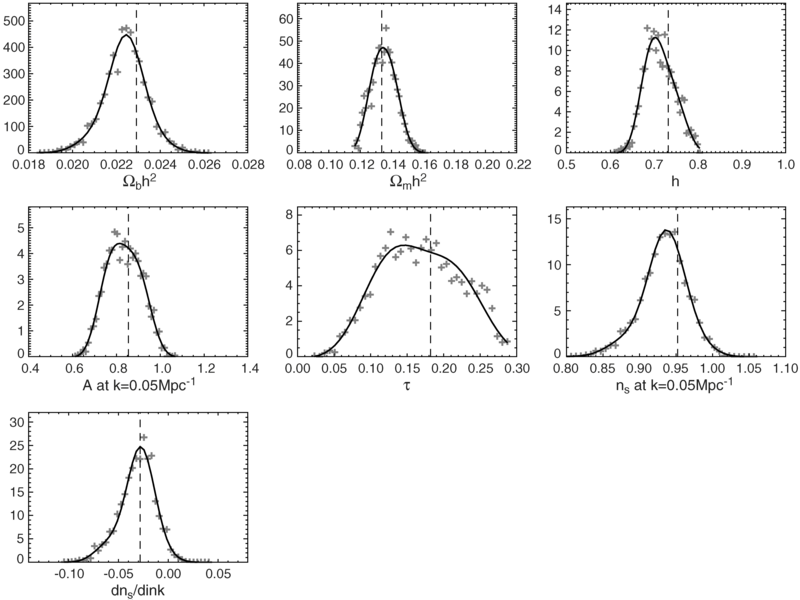 Left: Comparison of the best-fit ΛCDM model of § 3 based on WMAP data only to the 2dFGRS power spectrum (Percival et al. 2001). The bias parameter for the best-fit power-law ΛCDM model is 1.0, corresponding to a best-fit value of β = 0.45. 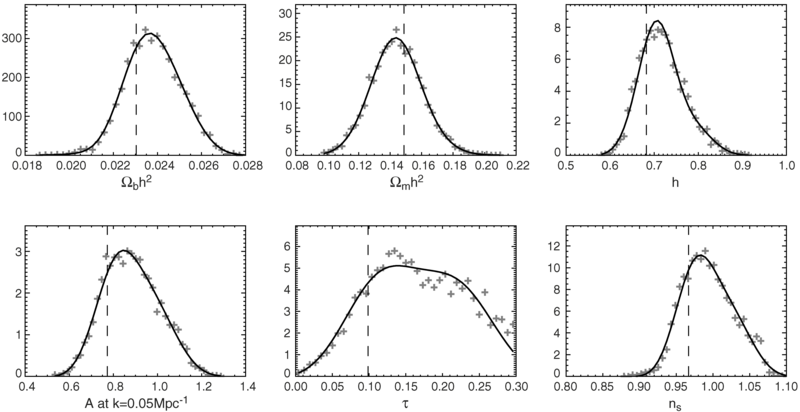 Right: Comparison of the best-fit power-law ΛCDM model of § 3 to the power spectrum at z = 3 inferred from the Lyα forest data. The data points have been scaled downward by 20%, which is consistent with the 1 σ calibration uncertainty (Croft et al. 2002). Left: Fraction of mass in bound objects as a function of redshift. The black lines show the mass in collapsed objects with mass greater than MHRL(z), the effective Jeans mass in the absence of H2 cooling for our best-fit PL ΛCDM model (thin lines are for the fit to WMAP only, and thick lines are for the fit to all data sets). The heavy line uses the best-fit parameters based on all data (which has a lower σ8), and the light line uses the best-fit parameters based on fitting to the WMAP data only. The dashed lines show the mass in collapsed objects with masses greater than the Jeans mass assuming that the minimum mass is 106 Msun. More objects form if the minimum mass is lower. Right: Ionization fraction as a function of redshift. The solid line shows ionization fraction for the best-fit PL ΛCDM model if we assume that H2 cooling is suppressed by photo destruction of H2. 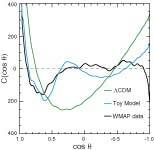 This figure suggests that H2 cooling may be necessary for enough objects to form early enough to be consistent with the WMAP detection. The heavy line is for the best-fit parameters for all data sets, and the light line is for the best-fit parameters for the WMAP only fit. The dashed lines assume that the objects with masses greater than 106 Msun can form stars. The gray band shows the 68% likelihood region for zr based on the assumption of instantaneous complete reionization (Kogut et al. 2003). Marginalized likelihood for various cosmological parameters in the running spectral index model for our analysis of the combined WMAP, CBI, ACBAR, 2dFGRS, and Lyα data sets. The dashed lines show the maximum-likelihood values of the global seven-dimensional fit. Left: The shaded region in the figure shows the 1 σ contours for the amplitude of the power spectrum as a function of scale for the running spectral index model fit to all data sets. The dotted lines bracket the 2 σ region for this model. The dashed line is the best-fit power spectrum for the power-law ΛCDM model. 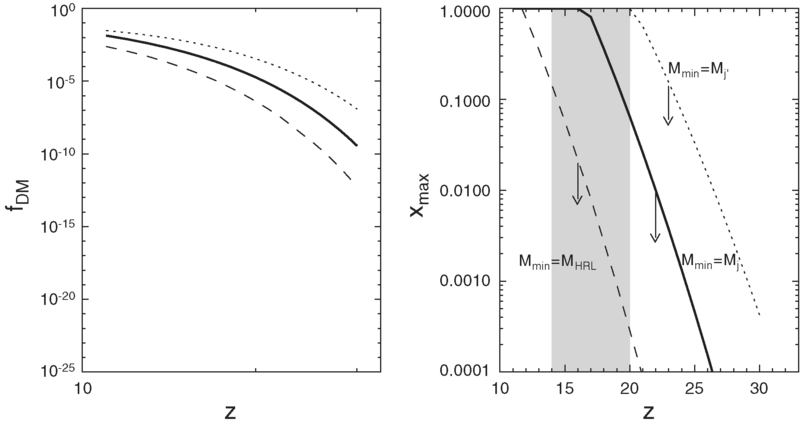 Right: The shaded region in the figure shows the 1 σ contours for the amplitude of the amplitude of mass fluctuations, Δ2(k) = k3P(k)/(2π2), as a function of scale for the running spectral index model fit to all data sets. The dotted lines bracket the 2 σ region for this model. The dashed line is the best fit for the power-law ΛCDM model. Left: Fraction of the universe in bound objects with mass greater than MHRL (dashed line), Mj = 106 Msun (solid line), and Mf (dotted line) in a model with a running spectral index. The curves were computed for the 1 σ upper limit parameters for this model (see Fig. 9). These should be viewed as upper limits on the mass fraction in collapsed objects. 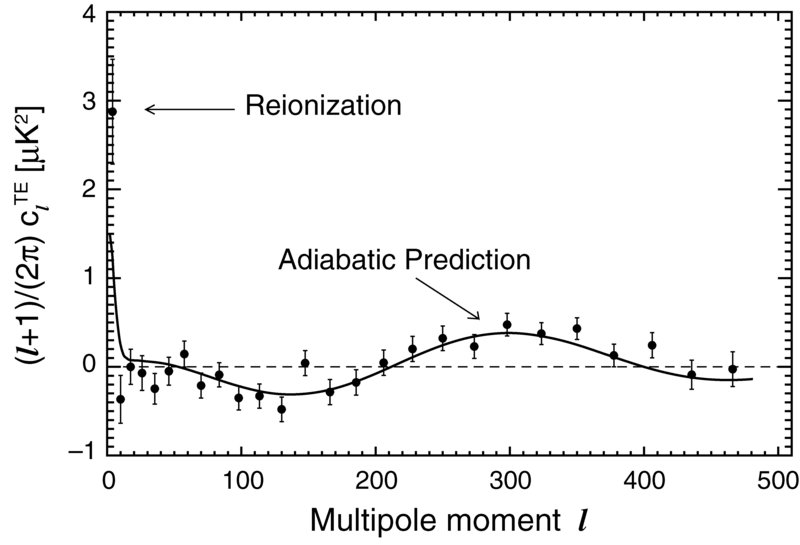 Right: Ionization fraction as a function of redshift and is based on the assumptions described in ξ 4.7. 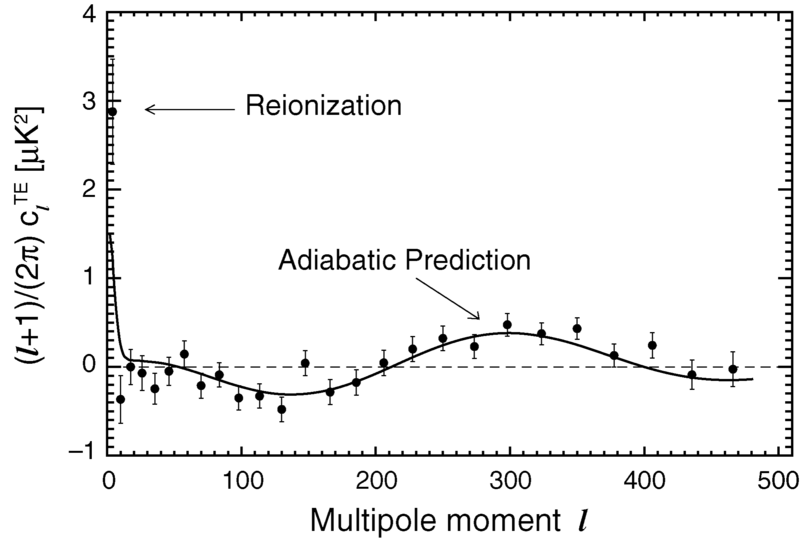 As in the left panel, we use the 1 σ upper limit estimate of the power spectrum so that we obtain ‘‘ optimistic ’’ estimates of the reionization fraction. 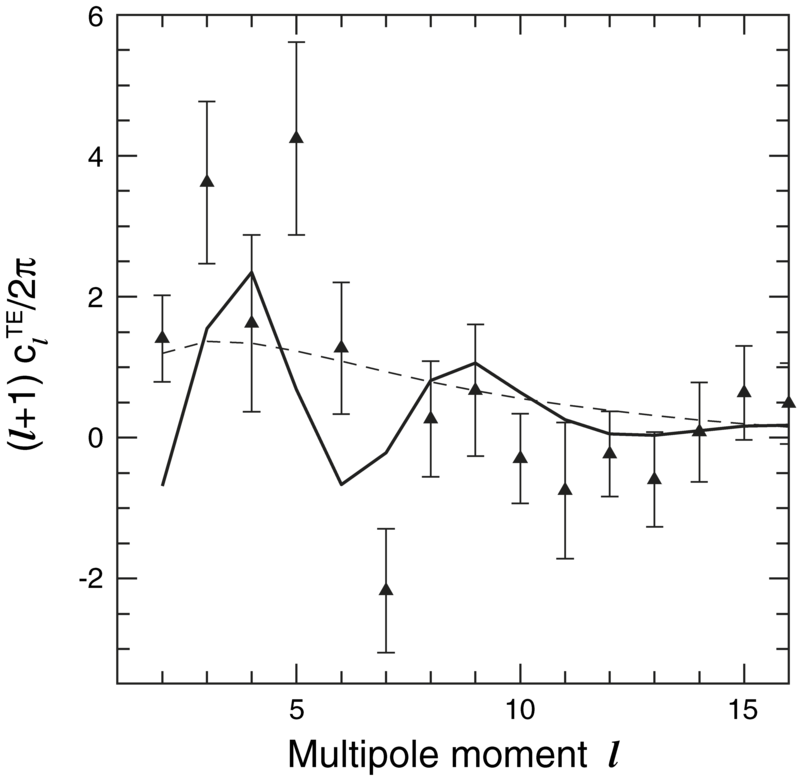 In the context of a running spectral index fit to the data, the WMAP detection of reionization appears to require that H2 cooling played an important role in early star formation. 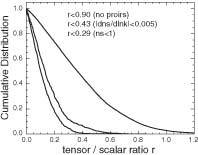 Constraints on dark energy properties. The upper left panel shows the marginalized maximum-likelihood surface for the WMAPext data alone and for a combination of the WMAPext+2dFGRS data sets. The solid lines in the figure show the 68% and 95% confidence ranges for the fit C supernova data from Perlmutter et al. (1999). In the upper right panel, we multiply the supernova likelihood function by the WMAPext+2dFGRS likelihood functions. 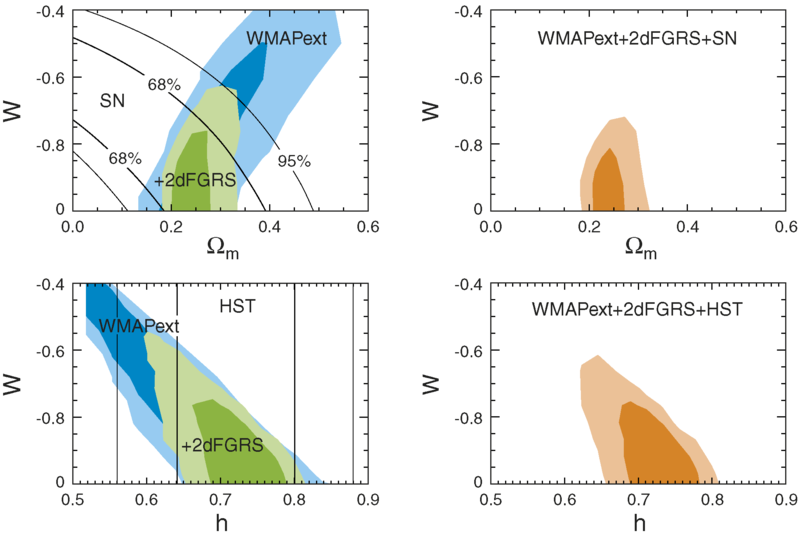 The lower left panel shows the maximum-likelihood surface for h and w for theWMAPext data alone and for theWMAPext+2dFGRS data sets. The solid lines in the figures are the 68% and 95% confidence limits on H0 from the HST Key Project, where we add the systematic and statistical errors in quadrature. 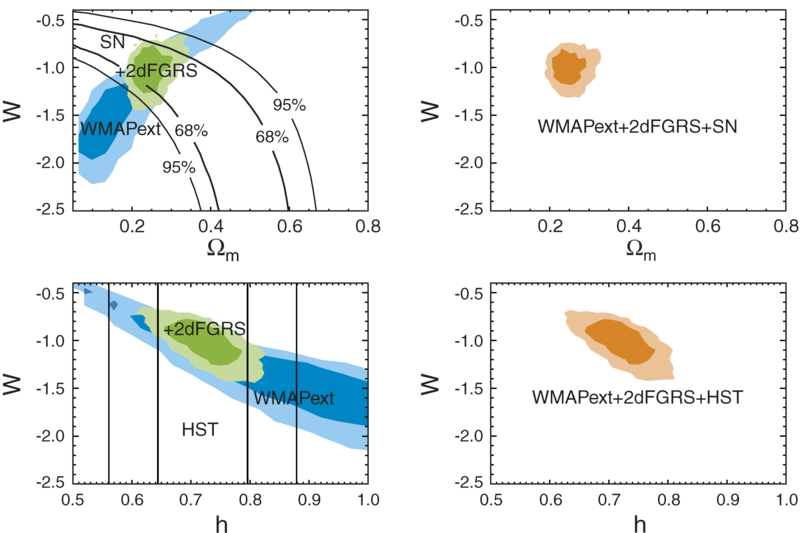 In the lower right panel, we multiply the likelihood function for the WMAPext+2dFGRS data by the likelihood surface for the HST data to determine the joint likelihood surface. The dark areas in these plots are the 68% likelihood regions, and the light areas are the 95% likelihood regions. Constraints on dark energy properties. The upper left panel shows the marginalized maximum-likelihood surface for the WMAPext data alone and for a combination of the WMAPext+2dFGRS data sets. The solid lines in the figure show the 68% and 95% confidence ranges for supernova data from Riess et al. (2001). In the upper right panel, we multiply the supernova likelihood function by the WMAPext+2dFGRS likelihood functions. 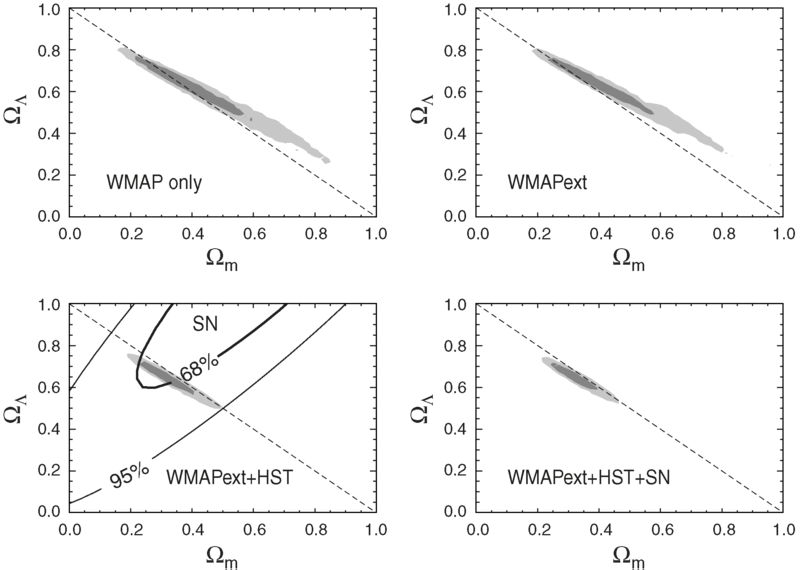 The lower left panel shows the maximum-likelihood surface for h and w for the WMAPext data alone and for theWMAPext+2dFGRS data sets. The solid lines in the figures are the 68% and 95% confidence limits on H0 from the HST Key Project, where we add the systematic and statistical errors in quadrature. In the lower right panel, we multiply the likelihood function for the WMAPext+2dFGRS data by the likelihood surface for the HST data to determine the joint likelihood surface. The dark areas in these plots are the 68% likelihood regions, and the light areas are the 95% likelihood regions. The calculations for this figure assumed a prior that w > -1. Constraints on the geometry of the universe:Ωm-ΩΛ plane. Two-dimensional likelihood surface for various combinations of data: WMAP (upper left); WMAPext (upper right); WMAPext+HST Key Project (supernova data [Riess et al. 1998, 2001] are shown but not used in the likelihood in this part of the panel) (lower left);WMAPext+HST Key Project+supernova (lower right). Marginalized cumulative probability of Ωνh2 based on a fit to the WMAPext+2dFGRS data sets (dashed line) and the cumulative probability based on a fit to the WMAPext+2dFGRS+Lyα data sets (solid line). The vertical lines are the 95% confidence upper limits for each case (0.21 and 0.23 eV). 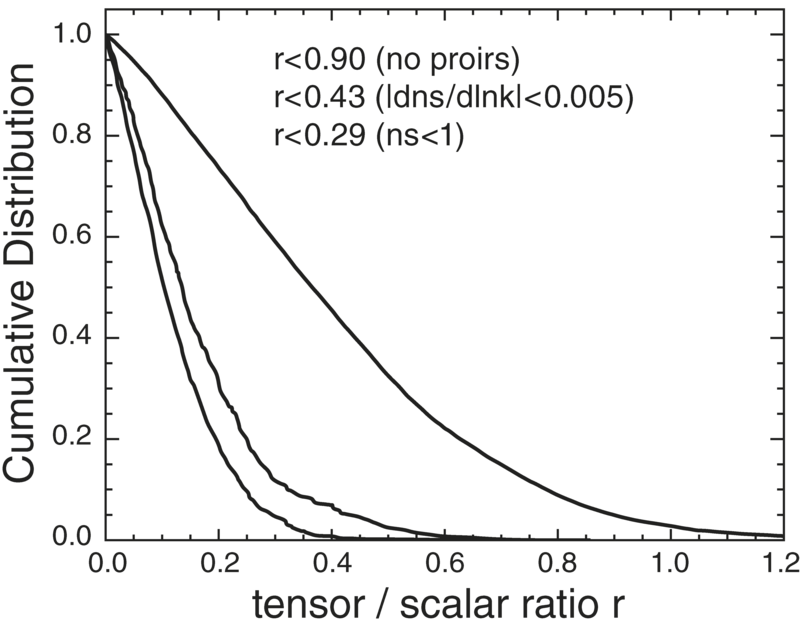 Cumulative likelihood of the combination of the WMAPext+2dFGRS+Lyα data sets as a function of r, the tensor/scalar ratio. The three lines show the likelihood for no priors, for models with |dn/d ln k|< 0.005, and for models with ns < 1. 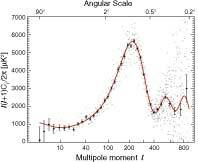 Angular correlation function of the best-fit ΛCDM model, toy finite universe model, and WMAP data on large angular scales. The data points are computed from the template-cleaned V-band WMAP using the Kp0 cut (Bennett et al. 2003c). TE power spectrum. Comparison of the data to the predicted TE power spectrum in our toy finite universe model and the ΛCDM model. 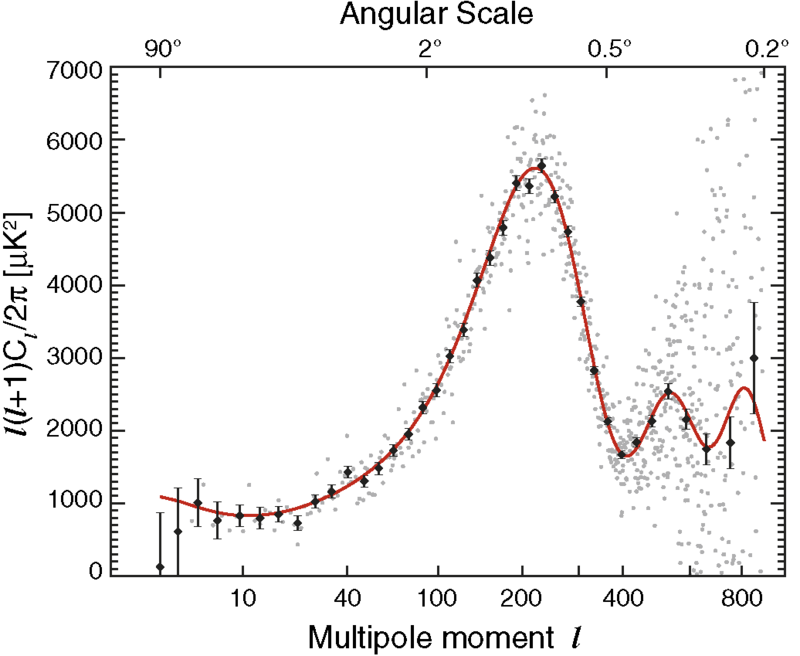 Both models assume that τ = 0:17 and have identical cosmological parameters. 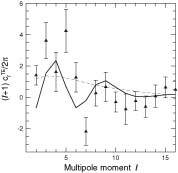 This figure shows that the TE power spectrum contains additional information about the fluctuations at large angles. While the current data cannot distinguish between these models, future observations could detect the distinctive TE signature of the model.